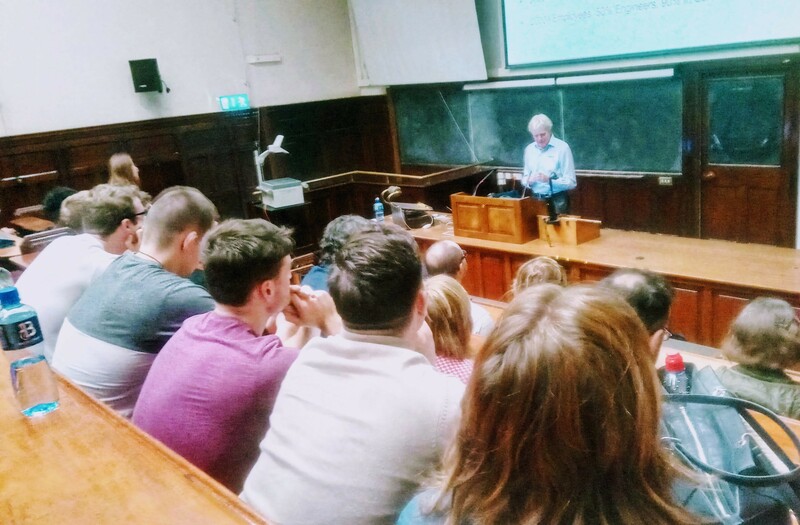 Friday 12th Oct 2018: A packed audience in the Schrodinger lecture theatre in the historic Physics Building, Trinity, was treated this week to a presentation on the rapid growth and cutting edge developments in cloud networking by Arista founder, Andy Bechtolsheim. Originally from Germany, Bechtolsheim went on to study for his Phd at Stanford University and became a highly successful entrepreneur, self-made billionaire and investor in the USA. He was cofounder of Sun Microsystems and in fact was one of the earliest investors to back Google back in 1998. The lecture was organised in conjunction with the School of Computer Science and Statistics and Trinity Research and Innovation (TR&I). Speaking to TR&I before the talk Bechtolsheim said he felt the gap between commercial research and fundamental research in computer science was “effectively zero”. Founded in 2004, Arista has proven to be a world leader in developing switch systems and software that have revolutionised the usability and speeds with regard to data centres and cloud networking. With offices both in Shannon and Dublin, Arista’s presence in Ireland is an important contribution to the Irish government’s ambition of making Ireland a global tech innovation hub. The company employs over 2,000 people globally and has an annual turnover of over 2 billion USD. While a non-tech person may not be familiar with Arista, anyone who has bought a book or tickets on-line, listened to streamed music or watched a movie on-line, would have used Arista software. Arista is the market leader in 100G (Gigabit per second) network switch adoption and in bringing new speeds and technology in this field to market. As an illustration of the phenomenal growth in switching speeds, deployment of 100G switches went from less than 10% to more than 50% in one year. It is now extending speeds to the 400G level, especially in the cloud and this will become much more common from 2020 onwards. Bechtolsheim explained how the digital world is moving to the cloud. The move from enterprise to the cloud is accelerating so cloud bandwidth demand keeps growing, in fact doubling every year. In 2017 the number of server shipments for deployment in the cloud exceeded enterprise deployments for the first time. The share of server deployments for cloud purposes will continue to increase for the foreseeable future. Referring to Moore’s law, Bechtolsheim indicated that it would seem the room for rapid continued expansion and improvement annually in this technology is still enormous. However, he also made the interesting point that 800G is theoretically the fastest switch possible. This is due to limitations imposed by natural losses that would occur in a printed circuit board (PCB). The key benefits that Arista products and software continues to bring include much greater scalability, resilience, performance and greater automation. But it also comes with cheaper pricing, which is attractive considering the significantly increased capacity and usability that comes with each new advance. Bechtolsheim said, “In our business the prices only go down”. He admitted that it can be a challenge for some customers to change and adapt, but the longer-term benefits of significantly greater speed and automation can be phenomenal. Some of the key technical strategies empowering Arista’s success include that they deploy “Merchant Silicon” from other vendors and don’t develop their own silicon (ASIC) designs. Arista’s core intellectual property lies in the software running on these chips. Arista's EOS Network Operating system runs a single binary software image across the Arista switching family. As a result it is easy to maintain and highly scalable. Dr. John Whelan, Technology Transfer Case Manager in Trinity speaking after the lecture said, “Clearly Arista’s presence in Ireland is a great example of how industry and the third-level sector can cooperate to their mutual benefit”. He continued, “Trinity has world class research facilities, educators, interns and graduates, while a high growth Arista will continue to need to source top level tech graduates, it is a good fit”.